The diagnosis and information that effects care plans for most of Highland’s patients begins in the Highland Hospital Laboratory where more than 2 million tests are performed each year. The laboratory is continually recognized for excellence. In 2017 it was recertified by New York State Department of Health and also passed several voluntary inspections, earning additional certifications. 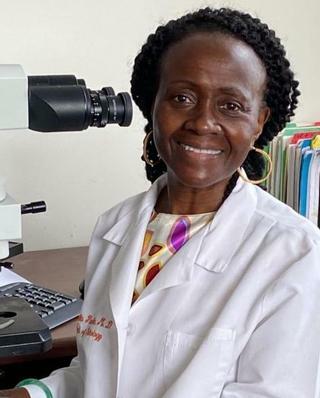 The following is an interview with Julietta Fiscella, M.D., CPE, FCAP, Chief, Department of Pathology, Cytopathology & Laboratory Medicine, about the role of Highland’s lab. Describe the Highland Hospital Lab. All of Highland’s lab functions are now located on the fourth floor and run 24 hours a day, seven days a week. The Lab office includes both Clinical and Anatomical sections, the clinical section includes: the Blood Bank, Chemistry, Hematology, Microbiology, Point of Care Testing, and Specimen Management. The Anatomical Pathology section includes: Gross Room/Pathology and Histology. The Gross room was recently renovated and relocated to the fourth floor to accommodate an increase in surgical pathology specimens because Highland is the center for breast and GYN Oncology surgery for UR Medicine. The Gross room is now validating Kutec, an imager used to identify metallic clips from mastectomy specimens. It’s important to note that the lab also supports clinical and anatomic research efforts by clinicians and participates in tissue-banking, securing tumor sections for future studies. What are the benefits of having voluntary inspections? In addition to passing the mandatory New York State Department of Health inspection, the Lab sought out and received Clinical and Anatomical Pathology Accreditation from the College of American Pathologists and passed inspection by the American Association of Blood Banking. All of these findings are reported to the Centers for Medicare and Medicaid Services (CMS). These inspections give us assurance that we are adhering to the highest standards. In turn we are able to help further educate the inspectors who spend time with us. Do you have any new equipment? The department recently added a new cobas 6000 ®analyzer, and will soon add another, to ensure state-of-the-art technology. These analyzers perform the bulk of testing for blood chemistry and the intricate process to transfer from current instruments to new models will require months of work but it’s worth it. What other statistics are important for physicians to know? The average turnaround time on any stat test that a clinician orders on a tube of blood is 30 minutes, with a compliance rate of 97 percent and the average turnaround time for surgical pathology biopsies is 24 hours. I am so proud of our excellent staff, including Karen Behlau, MT, Laboratory Manager, 53 licensed personnel, and 14 support personnel, who provide 24/7 coverage. Licensed personnel in our lab have a combined total of nearly 1,000 years of laboratory experience in their fields of specialty. What other observations can you share about how Highland’s lab has grown and developed during your 22 years here? New technology has given us the capabilities to analyze blood and tissue more precisely and more efficiently and communicate electronically. But it is still important to involve the human element in the diagnosis of disease. Before all of this technology physicians came to the lab on a regular basis to look at slides themselves. They learned from our technicians and our technicians learned from them and that is something I would like to see happen again. I hope our physicians know that they are welcome in the lab anytime.